The Corpse Flower is in bloom! Just a post to let you know the horribly smelly plant is once again in bloom. 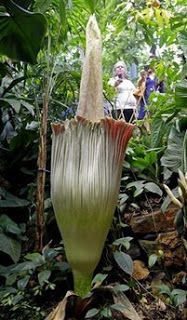 This one is from the Huntington Library in San Marino, Calif.
Doesn’t the Corpse Flower sound really cool? Not like a Petunia or Sun Flower. No, no. This is a Corpse Flower! They named it because its smelly, like rotting flesh. Seriously. I’m sure many have used it as creative inspiration, but I haven’t gotten around to it.